Visiting Austin this fall? Like art? Don&apos;t miss a chance to explore the city&apos;s most celebrated art museum. Take a time-out from the racing and festival action and clear your mind at the Blanton Museum of Art. One of the foremost university art museums in the country, the Blanton holds Central Texas&apos; largest public collection, with nearly 18,000 works spanning antiquity to the contemporary. The Blanton&apos;s holdings include Old Master Italian Renaissance and Baroque paintings, Western genre art, an encyclopedic collection of prints and drawings, and so much more. During your visit, be sure to dedicate time to the museum&apos;s Latin American collection - an impressive assembly of more than 2,100 modern and contemporary paintings, prints, drawings and sculptures by Frida Kahlo, Diego Rivera, Fernando Botero and other artists. In fact, the Blanton treats guests to one of the oldest, largest and most comprehensive collections of Latin American art in the country. "From cross cultural representations of the Virgin Mary from Colonial South America to the poetic sculptures of Doris Salcedo, we are thrilled to celebrate some of the most unique voices from the history of Latin American art," explains Blanton director Simone Wicha. Taking its name from an elegant sculpture on view in the exhibition by Enio Iommi: a stainless steel "line" that traces an infinite loop in space, La línea continuafeatures approximately 70 works from the Judy and Charles Tate Collection of Latin American art. Recently gifted to the museum, the collection includes painting, drawing, prints, sculpture and mixed media works by artists spanning the early 20th century to the present. Highlights: A 1917 cubist-period drawing by Diego Rivera, two cubist paintings by Wifredo Lam, a 1946 drawing by Frida Kahlo, and an abstract glass mosaic by Carlos Mérida. On view through 2016, this installation will be presented in two parts: In the first phase, the paintings of the Virgin are rendered within a traditional European style. In phase two, opening July 2015, the works reflect uniquely South American elements - the Virgin à la the New World. See how artistic styles and the importance of Spain and the Catholic Church were transmitted from Europe to the Americas, and watch the transformation unfold over centuries. 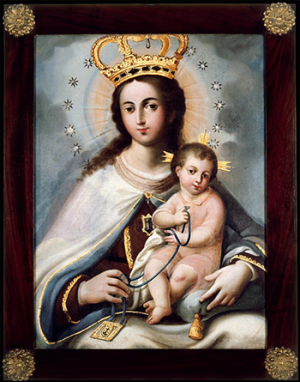 Highlights: The exhibit features seven paintings created in what are now the countries of Peru and Venezuela, representing devotions to Mary popular in Spain in the seventeenth and eighteenth centuries. For detailed information on upcoming exhibits, museum hours and admission, call 512-471-7324 or visit blantonmuseum.org.